On Wednesday, March 20, 2019, the Postpartum Resource Center of New York held a Volunteer Network Orientation Training at the Village of Islandia Town Hall in Islandia, New York. Special Guest Speakers for the event included: Nyna Giles, mental health advocate and author of The Bridesmaid's Daughter: From Grace Kelly's Wedding to a Women's Shelter - Searching for the Truth About My Mother. Wendy Isnardi, author of Nobody Told Me: My Battle with Postpartum Depression and Obsessive-Compulsive Disorder. To reach the event page, please go here. On Thursday, February 7, 2019, a book signing, author meet and greet was held fro Mrs. Suffolk County, Bridget Croteau for her book "Me, Again." Her book "Me, Again" is all about Bridget's journey with postpartum depression and anxiety following the births of her two children. She offers hope and resources to those who are currently going through a perinatal mood or anxiety disorder (like postpartum depression). This book is also a valuable resource to family and loved ones of someone going through this. The event was held at the Book Revue in Huntington, New York. To view the event page, please click here. On December 10, 2018, the Postpartum Resource Center of New York held a Paint Night fundraising event at La Tavola Trattoria in Sayville, New York. The event was hosted by Postpartum Resource Center of New York Coordinator, Wendy Isnardi. Proceeds from this event support the essential programs and services of the Postpartum Resource Center of New York (Tax ID# 11-3449880). 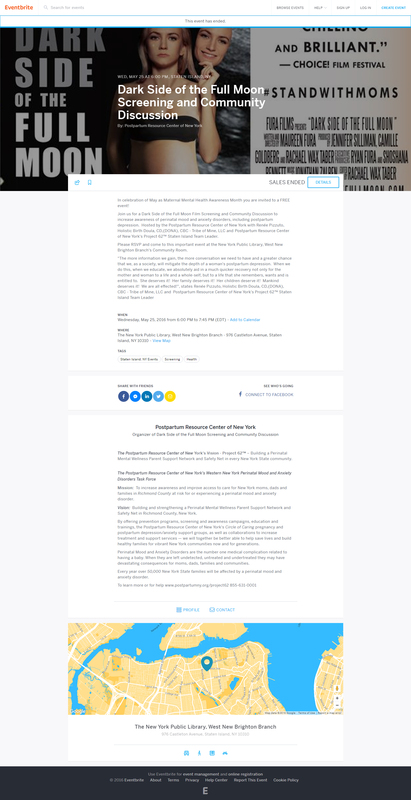 On December 6, 2018, the Postpartum Resource Center of New York held one of its Lisa Mary Reilly Visioning Educational Series events at the Long Island Marriott in Uniondale, New York. The event was presented by the Postpartum Resource Center of New York in collaboration with the Nassau County Maternal Mental Health Work Group of the Nassau County Department of Health's Perinatal Services Network. Special Guest Speaker was Cheryl Tatano Beck, DNSc, CNM, FAAN who spoke on Traumatic Childbirth: The Ever Widening Ripple Effect. The Guest Speaker was Heather Flores, Postpartum Resource Center of New York Volunteer. September 20 – November 29, 2018, No Mother Left Behind held six support group meetings. The aim of this group is for new moms to meet other new moms and work through some of the struggles of new parenthood. They discussed anxiety reducing techniques, mindful activities and more. Babies were welcomed. To view their Facebook event page, please go here. 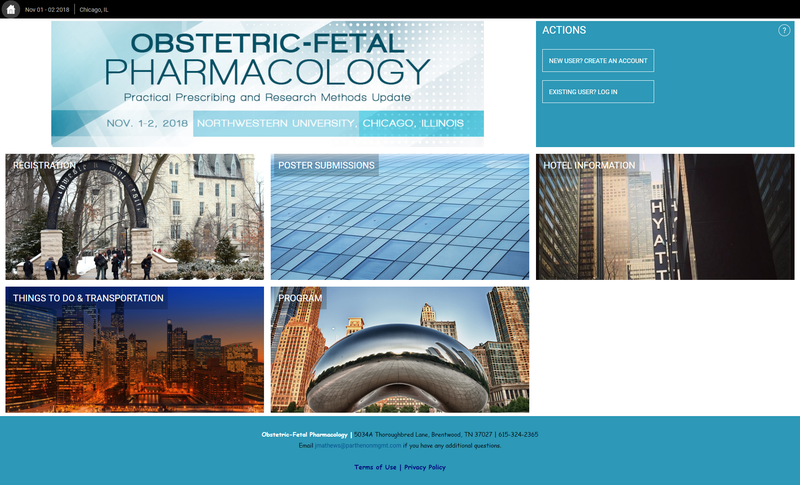 November 1 – 2, 2018, Obstetric-Fetal Pharmacology held its conference Obstetric-Fetal Pharmacology: Practical Prescribing and Research Methods Update at Prentice Women’s Hospital in Chicago, IL. To view the event page, please click here here. 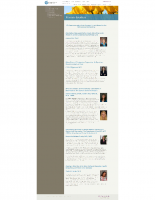 If the page is no longer available, you may view an archived webpage image below. 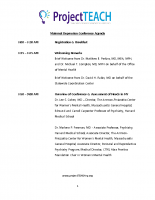 To view the event program, please click on the image below. 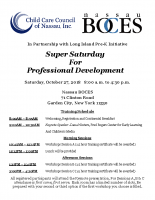 On Saturday, October 27, 2018, the Child Care Council for Nassau, Inc., held its Super Saturday for Professional Development event at Nassau BOCES in Garden City, New York. 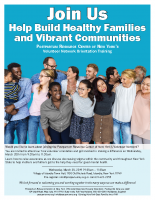 The Postpartum Resource Center of New York provided educational and resource materials for this event for those interested in perinatal mood and anxiety disorders, including postpartum depression/anxiety. On Wednesday, October 24, 2018, the WNY PMAD Task Force held its quarterly meeting at Buffalo State College, Caudell Hall, in Buffalo, New York.. If you are interested in being part of the Task Force, please visit their Facebook page here. 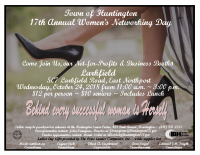 On October 24, 2018, the town of Huntington held its 17th Annual Women's Networking Day at Larkfield's in East Northport, New York. As in the past, the Postpartum Resource Center of New York had an informational table staffed by volunteers who answered questions and passed out literature to attendees. To view the event page flyer, please click on the image below. 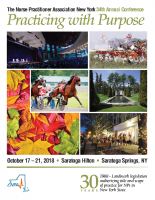 On October 17 – October 21, 2018, Nurse Practitioner Association held its 34th Annual Conference with the theme of Practicing with Purpose. To view the event page, please go here. 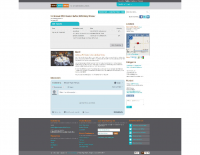 If the page is no longer available, you may view an archived image of the page below. View the event brochure below. On October 12, 2018, Project TEACH, a project funded by the New York State Office of Mental Health presented a conference to help healthcare providers and professionals provide the best possible care to mothers both during and after pregnancy. The conference/training was ideal for all providers in primary care, pediatrics, OB/GYN, and other practices that treat women and children. Postpartum Resource Center of New York's Executive Director, Sonia Murdock, presented at the conference with a training on Patient Education and Stigma Reduction. View the event flyer/agenda below. 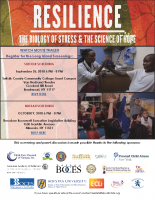 On October 9, 2018 in Nassau County as well as on September 26, 2018 in Suffolk County, a screening of the film Resilience was presented. The screening was followed by a panel discussion by experts from across Long Island who are working to address Adverse Childhood Experiences and build resiliency in our communities. The events were presented free of charge. A trailer of the movie can be seen here. View the event flyer below. 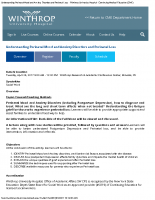 Webinar: Perinatal Mood & Anxiety Disorders: Essential Clinical Skills. On October 1, 2018, a free webinar titled Perinatal Mood and Anxiety Disorders: Essential Clinical Skills was presented by Dr. Christina G. Hibbert. 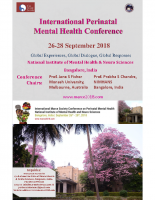 On September 26 – 28, 2018, the International Marcé Society held its Biennial Scientific Meeting with the theme of Perinatal Mental Health: Global Experiences, Global Dialogues, Global Responses. Below is the event poster, please click on it to view and/or download. On September 7, 2018, the Western NY Perinatal Mood and Anxiety Disorders Task Force joined the community of nearly 250k people walking in hundreds of cities across the country in support of the American Foundation for Suicide Prevention's mission to save lives and bring hope to those affected by suicide. Suicide is the second leading cause of death in postpartum women. Their goal as a task force is to increase awareness about postpartum mental health, to improve access to services for new moms and families, to provide training about these disorders to the mental health and medical community, and to influence positive changes regarding laws and policies affecting postpartum mothers..
To view the event page, please click here. 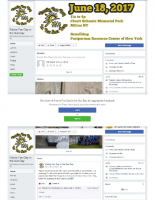 To learn more about and/or to join the WNY PMAD Task Force, please go here to visit their Facebook page (closed group). On August 2, 2018, the Postpartum Resource Center of New York hosted it's 20th Anniversary Summer Gala at the Bayview House, Captain Bill's Restaurant in Bay Shore, New York. The event was organized by Gala Committee Chairs, Mary Banahan, MS, PA-C, LCCE and Jennifer Rice, along with our Gala Committee members, and which was held to benefit the essential programs and services of the Postpartum Resource Center of New York. On July 31, 2018, a documentary Dark Side of the Full Moon Screening and Panel presentation/discussion was offered at Middle Country Library in Centereach, New York. In partnership with the Postpartum Resource Center of New York. Learn about perinatal mood and anxiety disorders, including postpartum depression and hear stories of women who witnessed or lived through a perinatal mood or anxiety. Bridget Croteau, Mrs. Suffolk County 2018/2019 and Sonia Murdock, Executive Director of the Postpartum Resource Center of New York participated in the panel presentation and discussion. If the page is no longer available, you may view an archived screenshot below. On July 25, 2018, the quarterly meeting of the WNY PMAD Task Force took place at Buffalo State College in Buffalo, New York. On May 12, 2018, the 10th Annual Sounds of Silence 5k/10k Run, Walk, Stroller-walk with Kid's Fun Run was held at Jones Beach State Park, Field 5 in Wantagh, New York. Over 600 runners, walkers, and stroller-walkers participated in this annual event to raise awareness for pregnancy and postpartum depression. The event is held in memory and celebration of Lisa Mary Reilly. On May 3, 2018, the Postpartum Resource Center of New York in collaboration with the Rochester Postpartum Wellness Coalition presented the Lisa Mary Reilly Visioning Educational Series – Dr. Cheryl Beck "Traumatic Childbirth: The Ever Widening Ripple Effect" at the Rochester Academy of Medicine in Rochester, New York. On May 2, 2018, Women & Children Services held it's 34th Annual Perinatal Symposium at the Crest Hollow Country Club, Woodbury, New York. On April 23, 2018, the WNY PMAD Task Force held their quarterly meeting in Buffalo, New York. On April 18, 2018, a Community Baby Shower was hosted by the Chautauqua County Maternal and Infant Health Program at the Senior Center in Dunkirk, New York. Moms-to-be and Moms were invited to attend this free event and receive gifts and treats. Also, local agencies were on hand to let them know how they can help the moms-to-be and mom to give their baby the great start that your little one deserves. On April 15, 2018, WNY Doulas hosted their Better Birth Conference in Amherst, New York. Attendees met with top birth and postpartum experts at this dynamic and interactive event. Also included were birth and postpartum with demos, resources and samples. Attendees were able to network with other moms, moms to be, families and local birth professionals. Paint For A Cause: Postpartum Resource Center of NY! 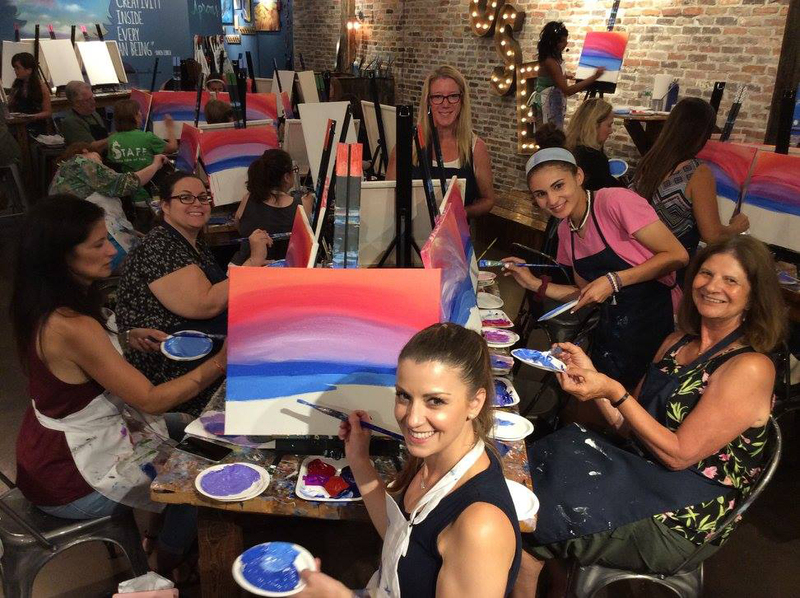 On Thursday, July 20, 2017, the Postpartum Resource Center of New York held a Paint Night event at Muse Port Jefferson, New York to raise awareness for perinatal mood and anxiety disorders and to raise funds for the essential programs and services of our non-profit organization. The evening included: painting, great food and drinks, and raffles. A photo from the event is below as well as an archived image of the event page. Thank you to Wendy Isnardi and Alicia Cassidy for organizing this event! 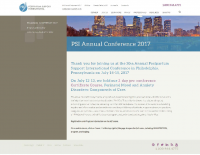 The 30th Annual Postpartum Support International Conference in Philadelphia, Pennsylvania was held on July 14-15, 2017. The annual PSI conference provides an opportunity to meet, learn together, and share ideas with others involved in the field of perinatal mood and anxiety disorders (PMADs). The Postpartum Resource Center of New York was in attendance again this year (as they have been for eighteen of the twenty years of our existence). Executive Director Sonia Murdock was joined by Board Member Sylvia Franwick and Mary Banahan, MS, PA-C, LCCE. During the event, Executive Director Sonia Murdock was honored with Postpartum Support International's Ilyene Barsky Memorial Coordinator's Award. To view the event page, please go here. If the event page is no longer available, you my view an archived image of event home page below. On Sunday, June 18, 2017, a Family Fun in the Sun Day was held at Cluett Schantz Memorial Park in Milton, New York. The event was held to raise funds for Postpartum Resource Center of New York and to bring awareness to Postpartum Depression while giving families something fun to do on Father’s day as a Family. The event will include live music, activities for children, food vendors and local businesses. To reach the event page, please click here. 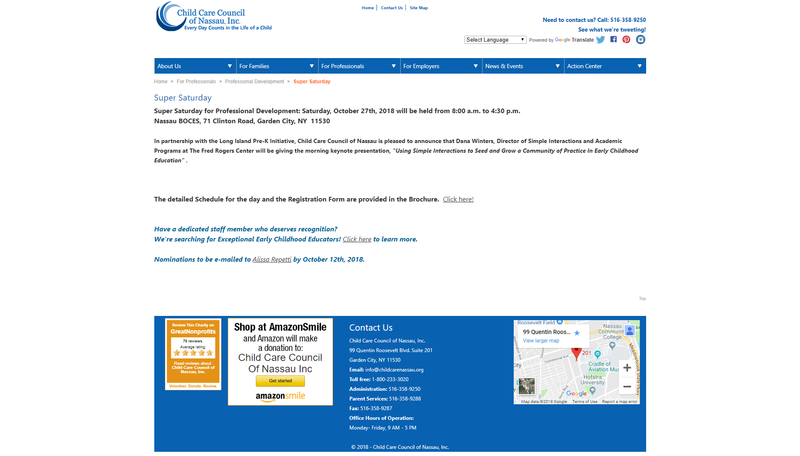 If the page is no longer available, please see an archived image of the event page below. The Postpartum Resource Center of New York is grateful to the organizers of this event for helping to bring awareness to the number one medical complication of pregnancy (perinatal mood and anxiety disorders – including postpartum depression) and for raising funds for the essential programs and services of our non-profit organization. On June 8-9, 2017, the New York State Perinatal Association held its Annual Conference in Albany, New York. 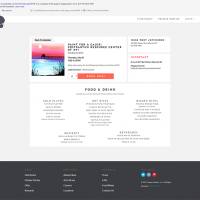 To reach the event website, please click here. If the page is no longer available, please see the conference flyer/program below. On Wednesday June 7, 2017, the Postpartum Resource Center of New York's Western New York (WNY) PMAD Task Force held its second quarterly meeting for 2017 at Buffalo State College in Buffalo, New York. Their next quarterly meeting will be held on Wednesday, September 13, 2017. To learn more about this meeting as well as other scheduled meeting for 2017, please click here. To learn more about the Western New York PMAD Task Force, please go here. 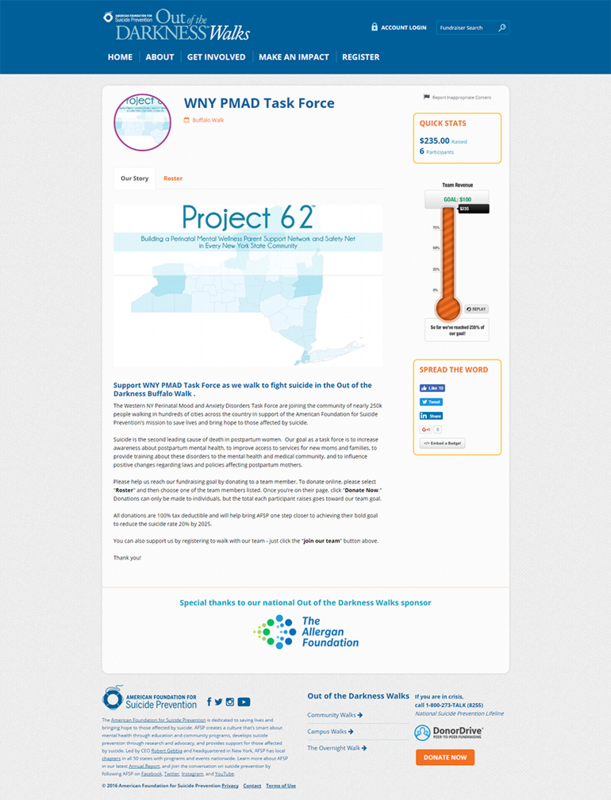 The Western New York PMAD Task Force is part of Project 62™. Click here to learn more. 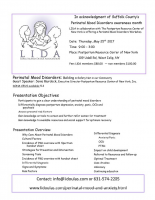 On Thursday, May 25th, the Long Island Doula Association (LIDA) in collaboration with the Postpartum Resource Center of New York (PRCNY), held a one day training Perinatal Mood Disorders: Building a Safety Net in our Community. The training was held at the offices of the Postpartum Resource Center of New York and featured Guest Speaker Sonia Murdock, Executive Director of PRCNY. 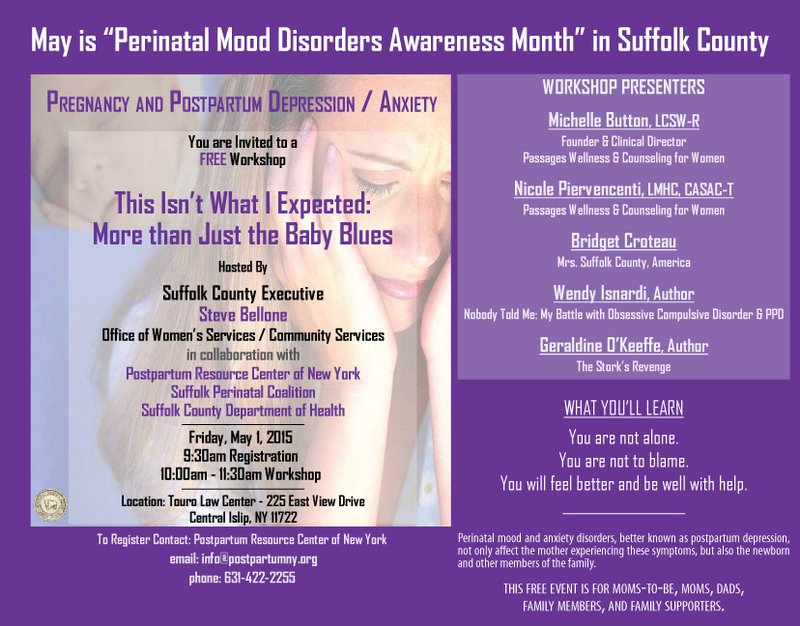 The event was done in acknowledgement of Suffolk County's Perinatal Mood Disorders Month (May). To view the event page, please click here. 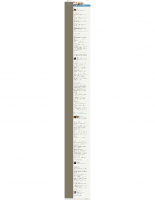 If the page is no longer available, you may view an archived image below. On Wednesday, May 17th and Thursday, May 18th, Buffalo State College and the Western New York (WNY) PMAD Task Force of the Postpartum Resource Center of New York co-hosted Postpartum Support International's Two-day Training. The event took place at Buffalo State College and included presenters: Birdie Gunyon Meyer, RN, MA | Ann Dunnewold, PhD | Carly Snyder, MD | Nancy Owen, RN, BSN,CLC | Sonia Murdock, Executive Director, Postpartum Resource Center of New York, Inc. 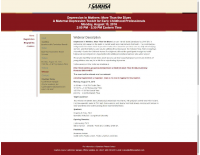 This two-day course, taught by expert and engaging faculty, used a thorough, evidence-based curriculum designed for psychiatrists, nurses, physicians, social workers, mental health providers, childbirth professionals, social support providers, and anyone interested in building skills for assessment and treatment of perinatal mood disorders. The event was held as part of May is Maternal Mental Health Awareness Month. To reach the event website, please go here. If the page is no longer available, you can view an archived image by clicking on the document below. To learn more about the Postpartum Resource Center of New York's Western New York (WNY) PMAD Task Force, which is part of Project 62™, please click here. 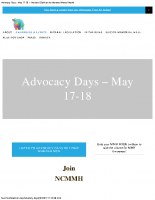 On Wednesday, May 17th and Thursday, May 18th, the National Coalition for Maternal Mental Health held its Advocacy Days in Washington, DC. During this event, advocates and survivors from across the country met in Washington D.C to let congress know that mothers matter and need support. The Event also provided attendees with the opportunity to meet with their local representatives, share their story to give a face to maternal mental health complications and ask congress to ensure maternal mental health initiatives receive the funding they desperately need. Advocacy Days 2017 included a Networking Luncheon, Congressional Briefing, and Reception on May 17th and congressional meetings on May 18th. 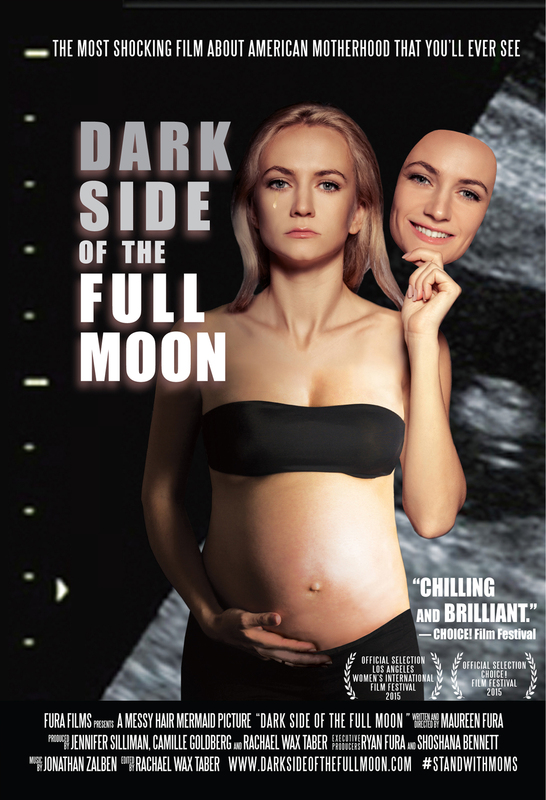 On Wednesday, May 3rd and Thursday, May 11th, a free Screening of the critically acclaimed documentary Dark Side of the Full Moon as well as an Awareness Education Presentation were presented at the H. Lee Dennison Building in Hauppauge, NY. The events were presented by Suffolk County Executive Steve Bellone and Suffolk County Office of Women’s Services in partnership with Postpartum Resource Center of New York, the Suffolk County Department of Health/Maternal and Infant Community Health Collaborative, the Suffolk County Women’s Advisory Commission, and the Suffolk Perinatal Coalition. To view the event poster, please click on the image below. The month of May is Maternal Mental Health Awareness Month around the world. It is also formally recognized as such in New York State since May of 2016, though it is referred to as Maternal Depression Awareness Month. During this month there are events held throughout the U.S. and World on the subject of Maternal Mental Health. In New York State, there were a number of events held during the month, including ones hosted or done in collaboration with the Postpartum Resource Center of New York. 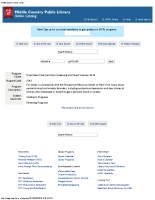 To see a listing of the events held in New York State during Maternal Mental Health Awareness Month as well as to view our Maternal Mental Health Awareness Month Digital Toolkit, please go here. On Saturday, April 29, 2017, the 9th Annual Sounds of Silence 5k Run for Pregnancy and Postpartum Depression/Anxiety Awareness took place at Jones Beach State Park, Field 5. More than 400 runners, walkers, and stroller-walkers took part of this important awareness and fundraising event, which is done in Memory of Lisa Mary Reilly. The event is organized and run by Sounds of Silence (SOS), Friends of the Postpartum Resource Center of New York, which is a fundraising committee of our non-profit organization. To learn more about Sounds of Silence, please go here. 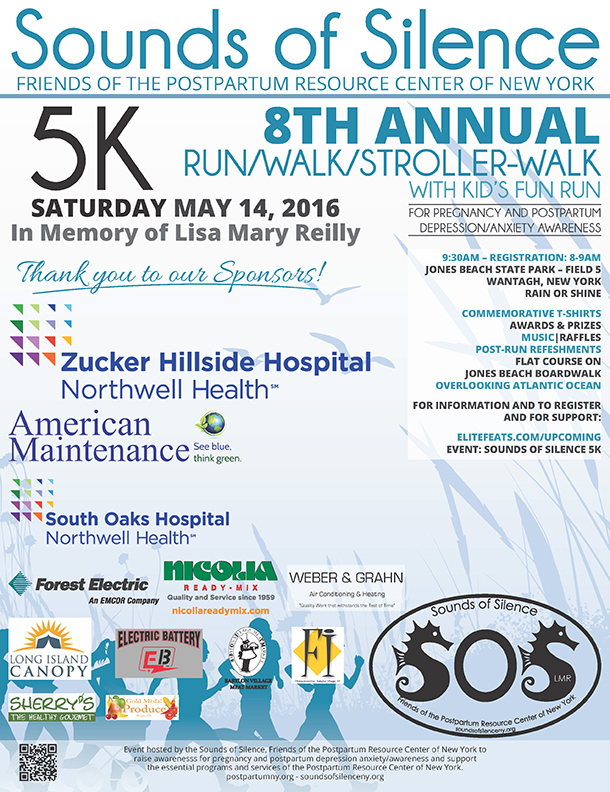 The SOS 5k Run also kicked off the events for May is Maternal Mental Health Month. 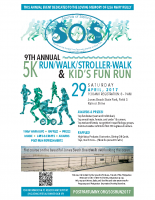 For more information about the 9th Annual SOS 5k Run and to see our Sponsors, please click here. The event poster is below. On Tuesday, April 25, 2017, Winthrop University Hospital hosted the program: Understanding Perinatal Mood and Anxiety Disorders and Perinatal Loss at Winthrop Research & Academic Conference Center, Mineola, NY. Topics discussed included: Perinatal Mood and Anxiety Disorders (including Postpartum Depression), how to diagnose and treat. What are the long and short term effects when not treated? Understanding the Unique grief for those who experience perinatal loss: Learners will be able to provide appropriate support and assist families to understand best way to help. Also, the documentary film Dark Side of the Full Moon was viewed and discussed. A lecture along with case studies was provided, followed by questions and answers. To reach the event website page, please go here. 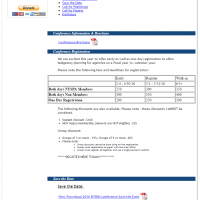 If the page is no longer available, you may view an archived image in the document below. On Sunday, April 2nd, 2017, the WNY Doulas held its 3nd Annual Better Birth Baby Shower event for all pre-expectant, expectant, and new moms. The event took place at Banchetti by Rizzo's in Amherst, NY. 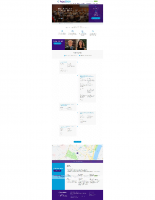 If the event page is no longer available, you may view an archived image of the page below. On March 6-9, 2017, the World Congress for the International Association of Women’s Mental Health (IAWMH) held its 7th annual meeting in Dublin, Ireland. The theme of the Congress this year was Rights, Resilience & Recovery. From the event website, it states "We believe that a rights, equality and scientifically evidence-based approach to women’s mental health can best support and empower women when they are ill and on the road to recovery. With this Congress we want to create a space for a rights and evidence based exploration of women’s mental health in Ireland and internationally." On Tuesday, March 7, 2017, the Postpartum Resource Center of New York's Western New York (WNY) PMAD Task Force held its first quarterly meeting for 2017 at Buffalo State College in Buffalo, New York. Their next quarterly meeting will be held on Thursday, June 8, 2017. To learn more about this meeting as well as other scheduled meeting for 2017, please click here. To learn more about the Western New York PMAD Task Force, please go here. The Western New York PMAD Task Force is part of Project 62™. Click here to learn more. 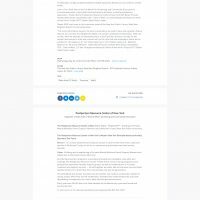 On February 28, 2017, the New York Zero-to-Three Network hosted an event on the subject of Maternal and Caregiver Depression: Impact on Young Children and Possible Remedies. Rebecca Weis, M.D. was the key presenter at this event, which was held at Ackerman Institute For The Family in Manhattan, New York. To reach the event page, please click here. If the event page is no longer available, you may view an archived image of that page below. 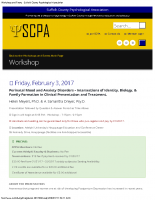 Friday, February 3, 2017, the Suffolk County Psychological Association Workshop and Training on the subject: Perinatal Mood and Anxiety Disorders - Intersections of Identity, Biology, & Family Formation in Clinical Presentation and Treatment. Presentations were given by Helen Meyers, Ph.D. & A. Samantha Dreyer, Psy.D., which was to be followed by a question and answer period. The event took place at Adelphi University's Hauppauge Education and Conference Center in Hauppauge, New York. To reach the event website page, please click here. 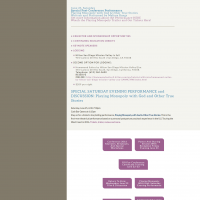 If the website page is no longer available, you may view an archived image of that page below. On Friday, November 11, 2016, the Postpartum Resource Center of New York held the 3rd Annual Lisa Mary Reilly Visioning Series event at the Metlife Building in New York City. This year's event featured special guest speaker Jane I. Honikman, MS. ane is the Co-Founder of the Postpartum Action Institute, located in Santa Barbara, California, and she is also the Founder of Postpartum Support International as well as the author of the books Community Support for New Families and Postpartum Action Manual.The Conference's theme was "Frontiers in Perinatal Mental Health". 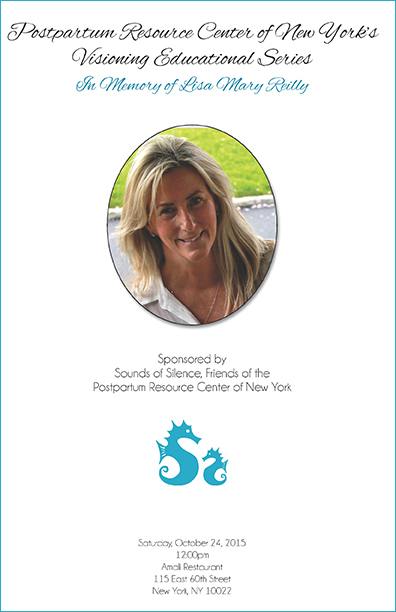 The event was sponsored by Sounds of Silence, Friends of the Postpartum Resource Center of New York. To reach the event page, please click here. To lean more about Sounds of Silence, please click here. The International Marcé Society held its Biennial Scientific Conference in Melbourne, Australia from September 25 - 29, 2016. 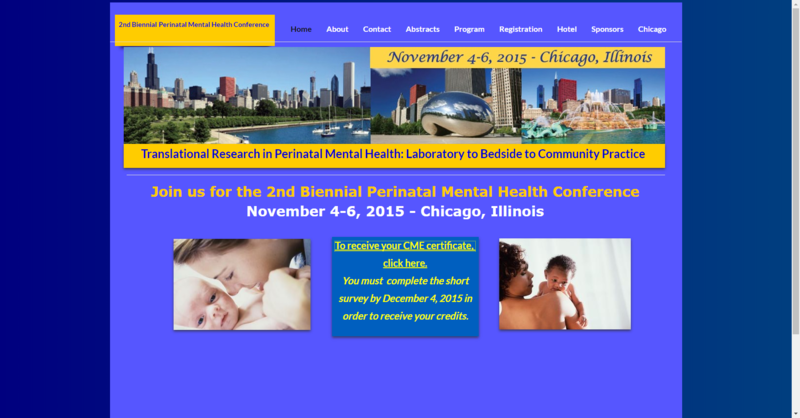 The Conference's theme was "Frontiers in Perinatal Mental Health". To reach the event page, please click here. 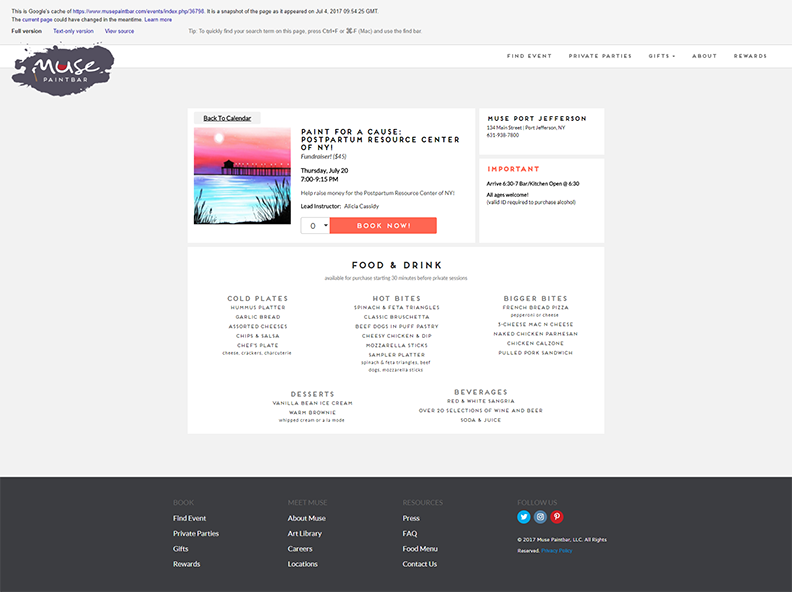 If the event page is no longer available, you may view an archived web image below. 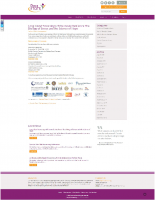 Project 62 – Western New York Perinatal Mood and Anxiety Disorders Task Force September Meeting. On Monday, September 12, 2016, the Western New York Perinatal Mood and Anxiety Disorders Task Force held a meeting to review past events and accomplishments as well as to plan future events, meetings, and goals. The event took place at Buffalo State College in Buffalo, New York. To learn about future events and meeting as well as about the WNY Task Force, please click here. Project 62 – Western New York Perinatal Mood and Anxiety Disorders Task Force Out of the Darkness Buffalo Walk. On Saturday, September 10, 2016, the Western New York Perinatal Mood and Anxiety Disorders Task Force joined a community of nearly 250,000 people walking in hundreds of cities across the country in support of the American Foundation for Suicide Prevention's mission to save lives and bring hope to those affected by suicide. To reach their event page and learn more about the Out of the Darkness Buffalo Walk, please click here. To learn more about the WNY Task Force, please click here. If the event page is no longer available, you may view an archived screenshot of the page below. Circle of Caring Pregnancy and Postpartum Depression/Anxiety Support Group Program – Advanced Facilitator Training was held on Tuesday, August 23rd and Tuesday August 30th, 2016 at the Islandia Town Hall in Islandia, New York. The event, hosted by the Postpartum Resource Center of New York and presented by Executive Director, Sonia Murdock, was for the community agencies/health centers and supporters who are interested in offering the Postpartum Resource Center of New York’s Circle of Caring Pregnancy and Postpartum Depression Support Groups..
To reach the event page, please click here. SAMHSA held a webinar on Monday, August 15, 2016. 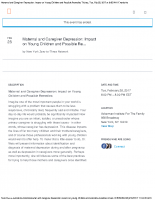 The subject of the webinar was Depression in Mothers: More Than the Blues and was billed as a user-friendly toolkit developed by SAMHSA, in partnership with experts in the fields of mental health and maternal and child health. To reach the webinar event page, please click here. If the page is no longer available, you may view it on the archived screenshot below. Comedy Fundraiser Night was held Thursday, August 11, 2016 at the Governor's Comedy Club in Levittown, New York. The event was a fun night of comedy that featured some up and coming comedians as well as a chance to raise awareness of the number one complication relating to child bearing – perinatal mood and anxiety disorders. Proceeds benefit the Postpartum Resource Center of New York. To visit the event page, please click here. Sounds of Silence, Friends of the Postpartum Resource Center of New York held a Paint Night on August 3, 2016 at the Post Office Cafe in Babylon, New York. 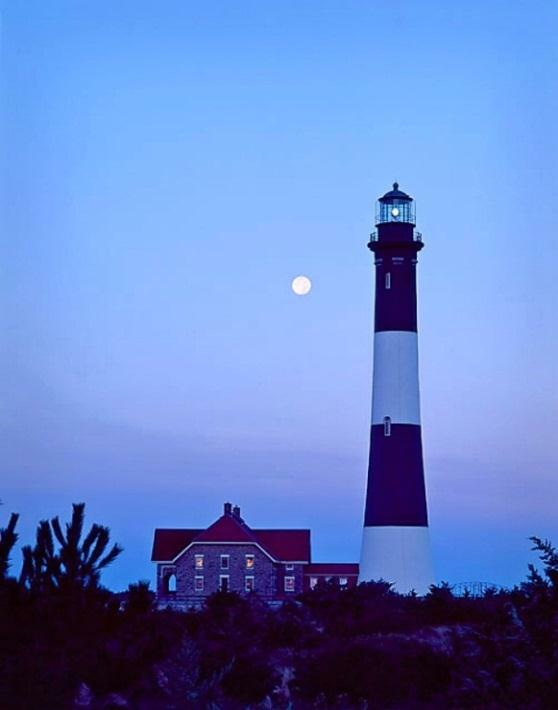 The event was a relaxing evening with friends engaging in some creative fun to celebrate summer and the life of Lisa Mary Reilly as they created their own paintings of the beautiful picture shown here of the Fire Island Lighthouse, which she photographed a few years ago. To visit the event page, please click here. To learn more about Sounds of Silence, please click here. Postpartum Support International held it's annual conference on June 24 - 25 at the Hilton San Diego/Mission Valley in San Diego, CA. To reach the event meeting page, please click here. If the event page is no longer available, please click on the image below to view an archived screenshot. Postpartum Resource Center of New York's Western New York PMAD Task Force (Project 62™ – Western New York) held a meeting on Friday June 3, 2016 at Buffalo State College in Buffalo, New York. To reach the event meeting page, please click here. Please click here to reach the Project 62™ – Western New York page for further information about the Task Force as well as about upcoming meetings and events. 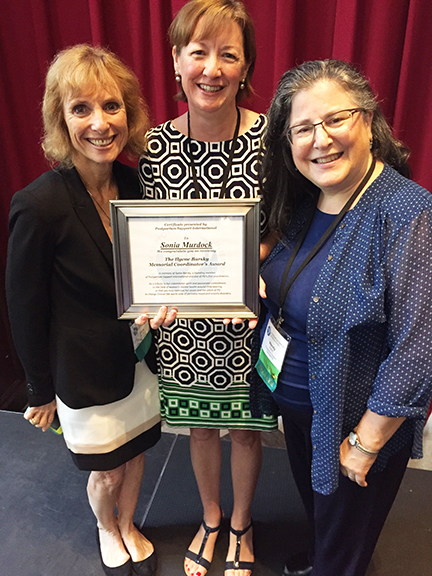 The 30th Annual NYSPA Perinatal Conference was held on June 2nd and 3rd, 2016 in Albany, New York. The subject of this year's conference was Birth Outcomes Matter: Effective Communications for Transition in Care. If the event page is no longer available, please click on the image below to view an archived version. Also, the event brochure can also be found below. 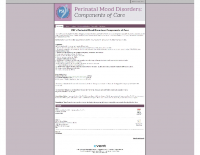 May 2016 was Perinatal Mood and Anxiety Disorders (PMAD) Awareness Month in New York State. For the first time ever, New York Governor Andrew Cuomo declared May as Maternal Depression Awareness Month in New York State. 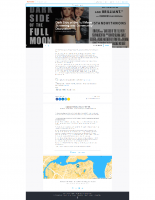 Dark Side of the Full Moon Screening and Community Discussion. On Wednesday, May 25, 2016 a free event was held at New York Public Library, West New Brighton Branch - 976 Castleton Avenue, Staten Island, New York. The event Hosted was hosted by the Postpartum Resource Center of New York. If the event page is no longer available, please click on the images below to view and/or download the archived page. 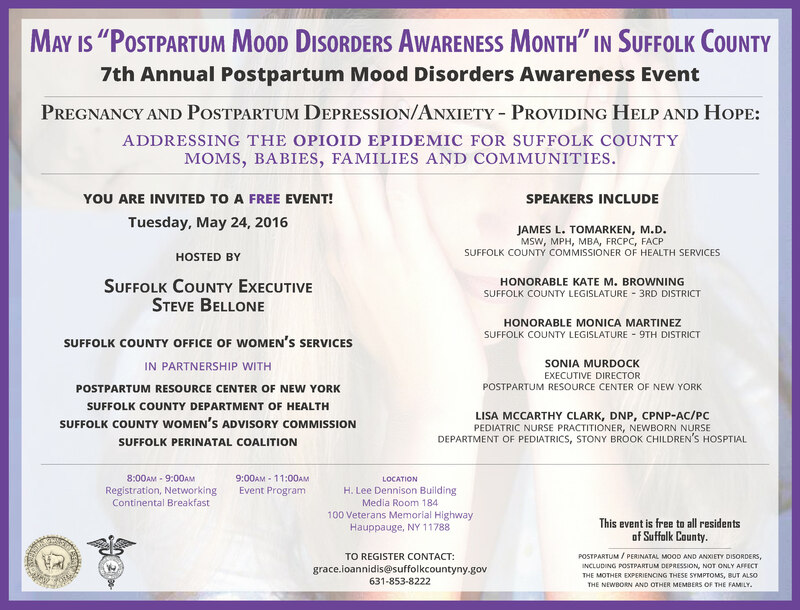 May is “Postpartum Mood Disorders Awareness Month” in Suffolk County. On Tuesday, May 24, 2016 a free event was held at the H. Lee Dennison Building, Media Room 184 100 Veterans Memorial Highway, Hauppauge, NY 11788. The topic of this 7th Annual Postpartum Mood Disorders Awareness Event was: Pregnancy and Postpartum Depression/Anxiety - Providing Help and Hope: Addressing the Opioid Epidemic for Suffolk County Moms, Babies, Families and Communities. The event Hosted by Suffolk County Executive Steve Bellone, Suffolk County Office of Women’s Services in partnership with the Postpartum Resource Center of New York, Suffolk County Department of Health, Suffolk County Women’s Advisory Commission and the Suffolk Perinatal Coalition. Film and Discussion: Dark Side of the Full Moon was held on Sunday, May 22, 2016 at the Brooklyn Public Library's Central Library at 10 Grand Army Plaza in Brooklyn, New York. If the event page is no longer available, please click on the image to view and/or download the archived page. 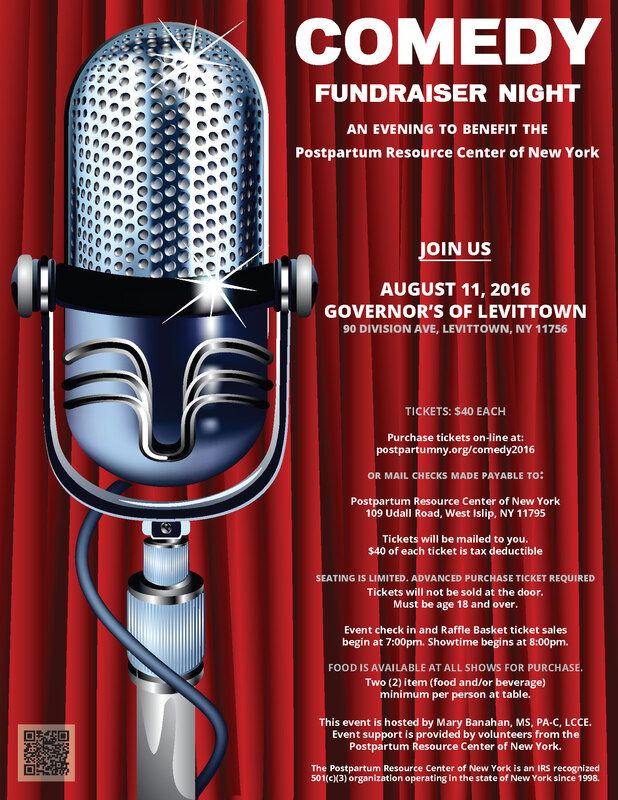 This annual event is held in Memory of Lisa Mary Reilly and takes place to raise awareness of the number one complication of pregnancy - Perinatal Mood and Anxiety Disorders (PMAD) - which includes Postpartum Depression as well as raise funds for the essential programs and services of the Postpartum Resource Center of New York. A special focus of the event is the Lisa Mary Reilly Visioning Educational Series, which is part of Project 62™ - Building a Perinatal Mental Wellness Parent Support Network and Safety Net in every New York State community. To learn more about this program, please click here. All proceeds contributed support the essential programs and services of the Postpartum Resource Center of New York, Inc., a 501 (c)(3) IRS recognized non-profit organization. Tax ID # 11-3449880. 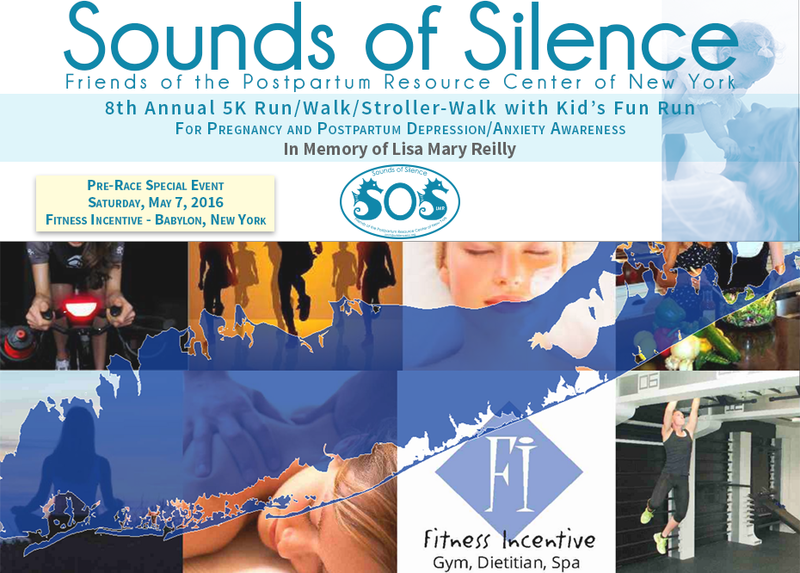 Fitness Incentive, a long time supporter of the Sounds of Silence, Friends of the Postpartum Resource Center of New York's Annual 5k Run/Walk/Stroller-Walk, held a special event in support of this event. On Saturday, May 7th, members and visitors were asked to dedicate their work-out at Fitness Incentive in honor of Lisa Mary Reilly. Lisa's sister, Erin Mascaro, was on hand along with other members of the Sounds of Silence team to collect donations in Lisa's honor. Please click here to visit our event page. 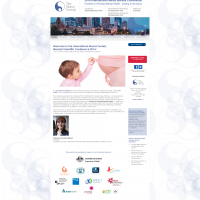 Perinatal Mood and Anxiety Disorders: Film Screening, Panel Discussion and Community Awareness. The Social Work Department at Buffalo State College in collaboration with Postpartum Resource Center of New York's Western New York Perinatal Mood and Anxiety Disorders Task Force presented a FREE screening of the critically acclaimed documentary Dark Side of the Full Moon on April 15, 2016 at Buffalo State College in Buffalo, New York. This important event, which was sold out, included a reception, exhibit tables, screening and panel discussion — plus a book Signing by Dr. Kimberly Zittel-Barr, Author of Postpartum Mood Disorders: A Guide for Medical, Mental Health and other Support Providers. The event was sponsored by the Faculty Student Association Founders' Fund. To reach the event page, please click here. If the event page is no longer available, you may view it here. Policy Breakfast Panel on Women, Pregnancy, and the Opioid Epidemic in New York. ACOG District II partnered with the Fellow Alumnae Board of the Center for Women in Government & Civil Society, part of SUNY Albany's Rockefeller College, to sponsor a Policy Breakfast Panel on Women, Pregnancy, and the Opioid Epidemic in New York. The event took place Thursday April 14, 2016 in Albany, New York. Sonia Murdock, Executive Director of the Postpartum Resource Center of New York, was among six expert panelists who discussed various aspects of the opioid epidemic and the unique ways in which women are affected. To reach the event meeting page, please click here. NASPOG 2016 Biennial Meeting took place April 8-10, 2016 in New York City at the New York Academy of Science. Executive Director of the Postpartum Resource Center of New York, Sonia Murdock, attended this important event. To reach the event meeting page, please click here. Postpartum Resource Center of New York's Western New York PMAD Task Force (Project 62™ – Western New York) held a meeting on Wednesday March 3, 2016 at Buffalo State College in Buffalo, New York. To reach the event meeting page, please click here. Postpartum Resource Center of New York's Western New York PMAD Task Force (Project 62™ – Western New York) held a meeting on Wednesday January 27, 2016 at Buffalo State College in Buffalo, New York. The meeting included a discussion of next steps as well as further planning of the Perinatal Mood and Anxiety Disorders: Film Screening, Panel Discussion and Community Awareness event, which will be held on Friday, April 15, 2016 at Buffalo State College. This free event will include a screening of the Documentary Dark Side of the Full Moon, panel discussion, book signing, and exhibit tables. 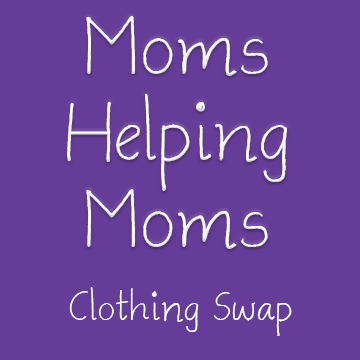 Moms Helping Moms Clothing Swap took place on Saturday, November 7, 2015 at Westminster United Presbyterian Church in West Islip, NY - and was hosted by the Postpartum Resource Center of New York. Please click here to reach the event page. 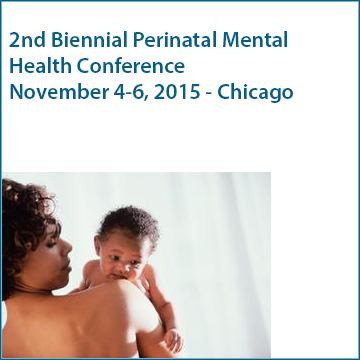 The 2nd Biennial Perinatal Mental Health Conference took place on November 4-6, 2015 in Chicago, Illinois at the Northwestern University Feinberg Conference Center. Please click here to reach the event page. 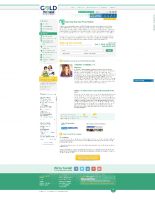 If the page is no longer available, you may view an archived screenshot here. 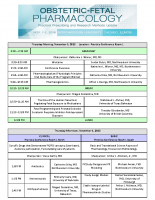 Postpartum Resource Center of New York's Western New York PMAD Task Force (Project 62™ – Western New York) held a meeting on Thursday October 29, 2015 at Buffalo State College in Buffalo, New York. The meeting included a screening of the Documentary Dark Side of the Full Moon as well as a Volunteer Orientation Workshop. 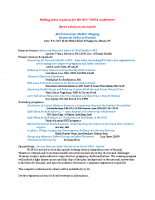 The Postpartum Resource Center of New York's 2015 Luncheon and Visioning Educational Series ~ In Memory of Lisa Mary Reilly took place on Saturday, October 24, 2015 at Amali Restaurant in New York City. On October 23 and 24, 2015, the Seleni Institute offered Trainings for Mental Health Providers in New York City. The two-day event offered Clinical Training Covering Treatment of Perinatal Mood & Anxiety Disorders and Perinatal Grief & Loss. 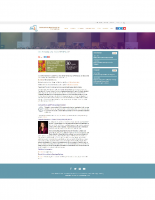 Please click here to reach the Seleni Institute's website for information on future events. A Maternal Mental Illness and the Criminal Justice System Seminar was presented by Postpartum Support International A Continuing Education Training for Legal and Mental Health Professionals on Thursday, October 22 and Friday October 23, 2015 in Cedar Knolls, New Jersey. Please click here to reach the event page (you will be leaving the Postpartum Resource Center of New York's website). Postpartum Support International Certificate Training Program in collaboration with Zucker Hillside Hospital was held on Monday, October 19, 2015 in Great Neck, New York. 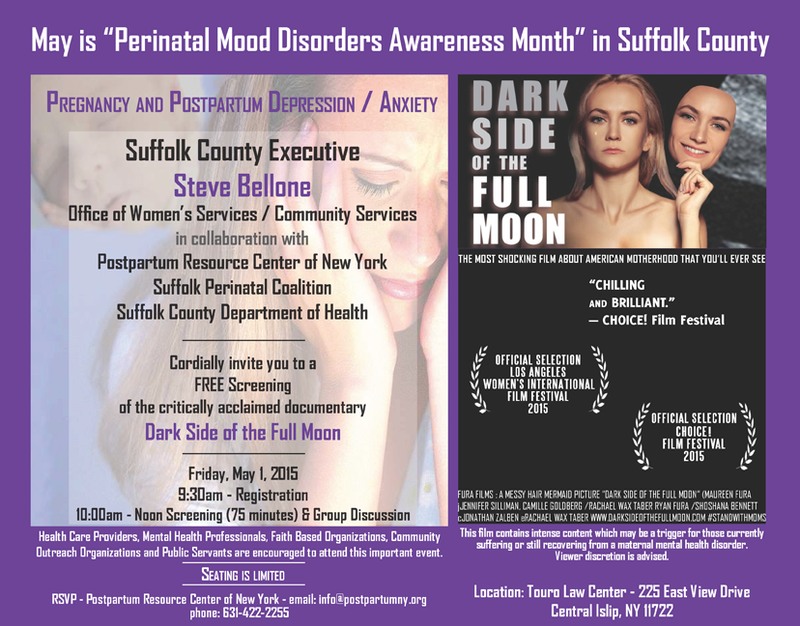 Zucker Hillside Hospital Perinatal Psychiatry in collaboration with the Postpartum Resource Center of New York and the Nassau County Perinatal Mood and Anxiety Disorders Task Force Presents Dark Side of the Full Moon Free Documentary Screening. Movie will be followed by multidisciplinary panel discussion. The event took place on Monday, October 5, 2015 at the Long Island Jewish Medical Center LIJMC at the Teaching Center in New Hyde Park, New York. Postpartum Resource Center of New York's Western New York PMAD Task Force (Project 62™ – Western New York) held a meeting on Thursday September 24, 2015 at Buffalo State College in Buffalo, New York. 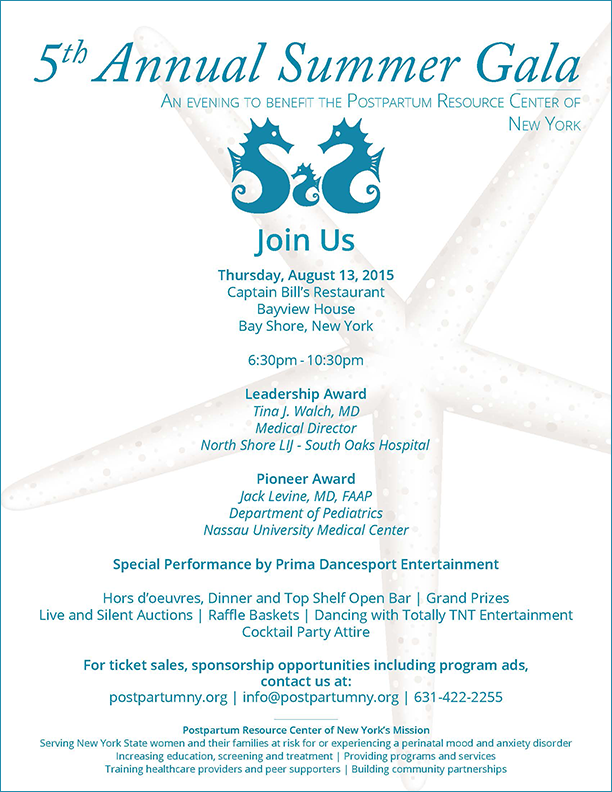 The 5th Annual Summer Gala to benefit the Postpartum Resource Center of New York was held on Thursday, August 13, 2015 at Bayview House — Captain Bill's Restaurant in Bay Shore, New York. To learn more about this event as well as to see photographs from it, please click here. 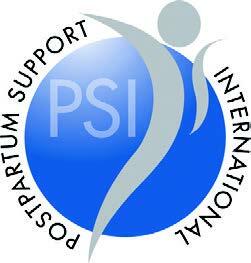 Postpartum Support International's 28th Annual PSI Conference was held from June 24 – June 27, 2015 in Plymouth, Michigan. The event was done with the Tree of Hope Foundation — Planting seeds of hope: overcoming stigma, increasing options, and embracing innovative treatments. To reach the event page at the PSI website, please click here. On Saturday, June 20, 2015, Postpartum Progress will held its 3rd Annual Climb Out of the Darkness event to raise awareness about maternal mental illnesses such as postpartum depression, postpartum anxiety & OCD, postpartum PTSD, postpartum psychosis, postpartum bipolar disorder, and pregnancy depression and anxiety. The Postpartum Resource Center of New York was honored to be selected as one of the recipients of the Climb Out of the Darkness 2015 Grant. Please click here to reach the PRCNY event page highlighting this event. 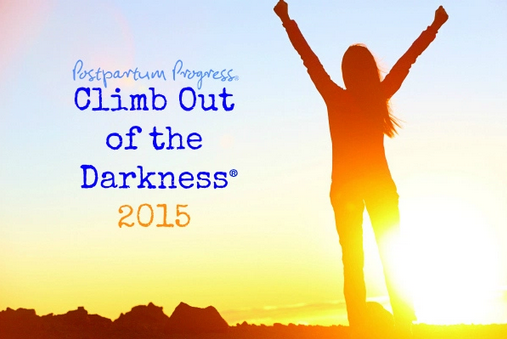 Click here to reach Postpartum Progress for it's latest news including upcoming Climb Out of the Darkness events. 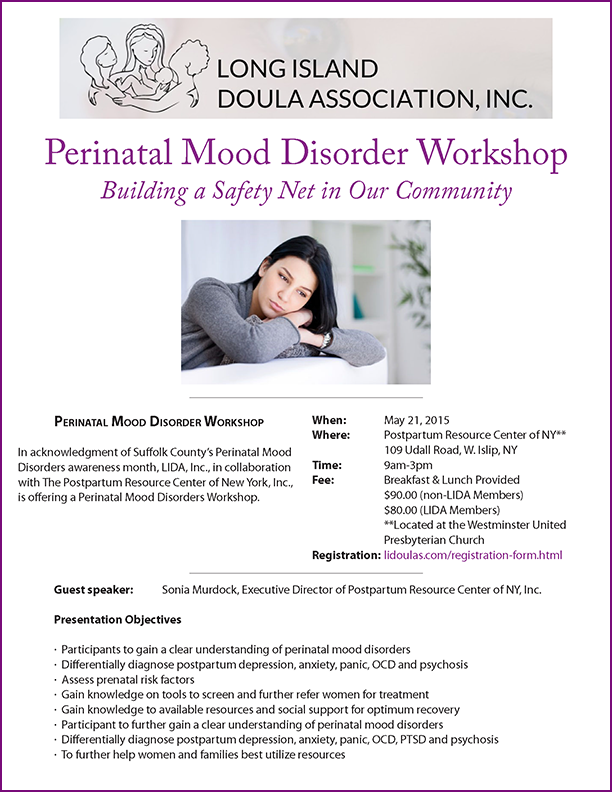 As an acknowledgment of Suffolk County’s Perinatal Mood Disorders awareness month, LIDA, Inc., in collaboration with The Postpartum Resource Center of New York presented this full-day workshop on Perinatal Mood Disorder Workshop: Building a Safety Net in Our Community. The event was held on Thursday May 21, 2015. To read more about this event, please click here to reach the event page. You will also find photographs taken from the event. 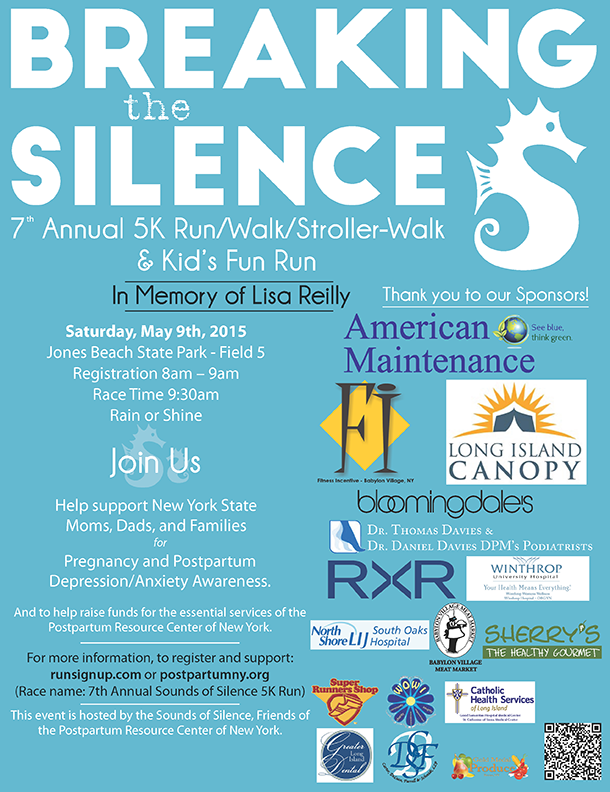 On Saturday May 9, 2015, the 7th Annual Sounds of Silence 5k Run/Walk/Stroller-Walk took place to raise awareness for pregnancy and postpartum depression/mood disorders at Field 5 at Jones Beach State Park in Wantagh, New York. This year's race was dedicated to the memory of Lisa Mary Reilly. To read more about this event, please click here to reach the event page. You will also find photographs and video taken from the event. 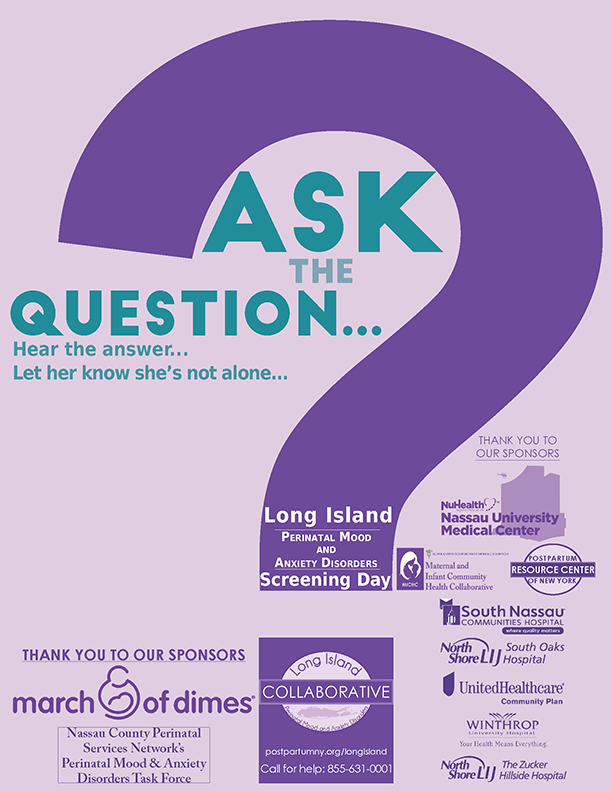 On Saturday, May 2, 2015, the Long Island Perinatal Mood and Anxiety Disorders Collaborative of the Postpartum Resource Center of New York, held the inaugural Long Island Screening Day for Perinatal Mood and Anxiety Disorders Awareness event. Over 1,000 families were reached as a result of our efforts for the first ever Long Island Screening Day for Perinatal Mood and Anxiety Disorders Awareness! To read more about this event, please click here to reach the event page as well as to see photographs taken at the event locations. 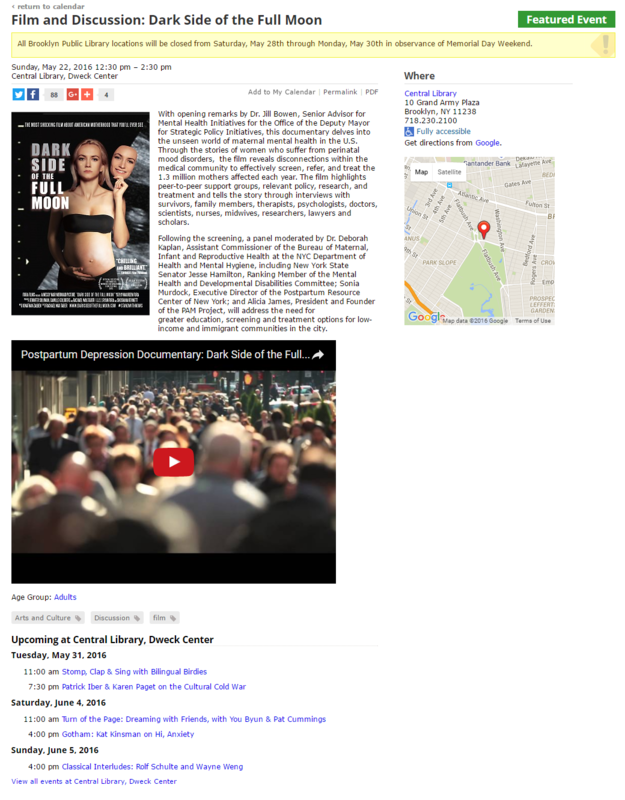 On Friday, May 1, 2015 Health Care Providers, Mental Health Professionals, Faith Based Organizations, Community Outreach Organizations and Public Servants were offered a FREE Screening of the critically acclaimed documentary Dark Side of the Full Moon was presented at Touro Law Center in Central Islip, New York. 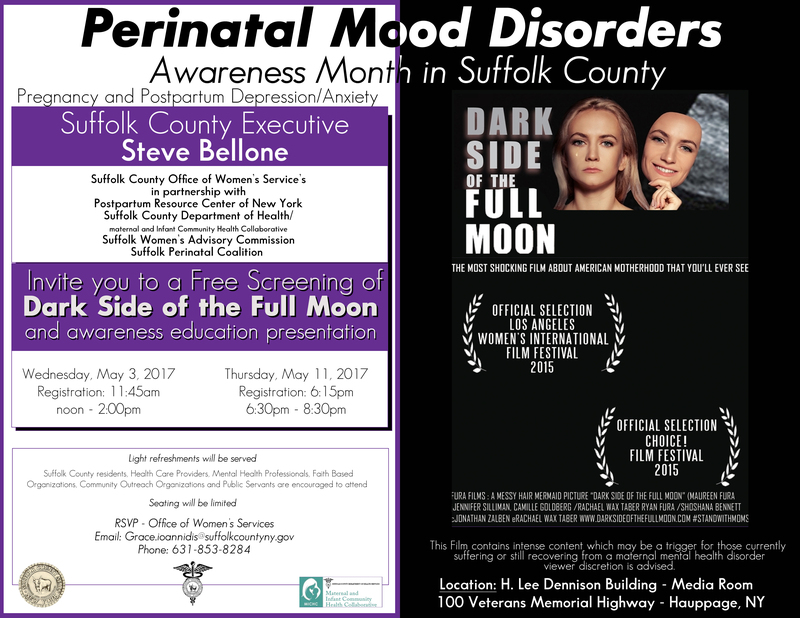 The event was hosted by Suffolk County Executive Steve Bellone, the Office of Women’s Services / Community Services, and in collaboration with Postpartum Resource Center of New York, Suffolk Perinatal Coalition, and Suffolk County Department of Health - this screening is the kick-off event for “Perinatal Mood Disorders Awareness Month” in Suffolk County. To read more about this event, please click here to reach the event page. On Friday, May 1, 2015 a FREE workshop was offered to moms-to-be, moms, dads, family members and family supporters. The subject of this important workshop was: This Isn’t What I Expected: More than Just the Baby Blues. The event was hosted by Suffolk County Executive Steve Bellone, the Office of Women’s Services / Community Services, and in collaboration with Postpartum Resource Center of New York, Suffolk Perinatal Coalition, and Suffolk County Department of Health - this workshop is one of the kick-off events for “Perinatal Mood Disorders Awareness Month” in Suffolk County. Please click here to reach the event page for further information. 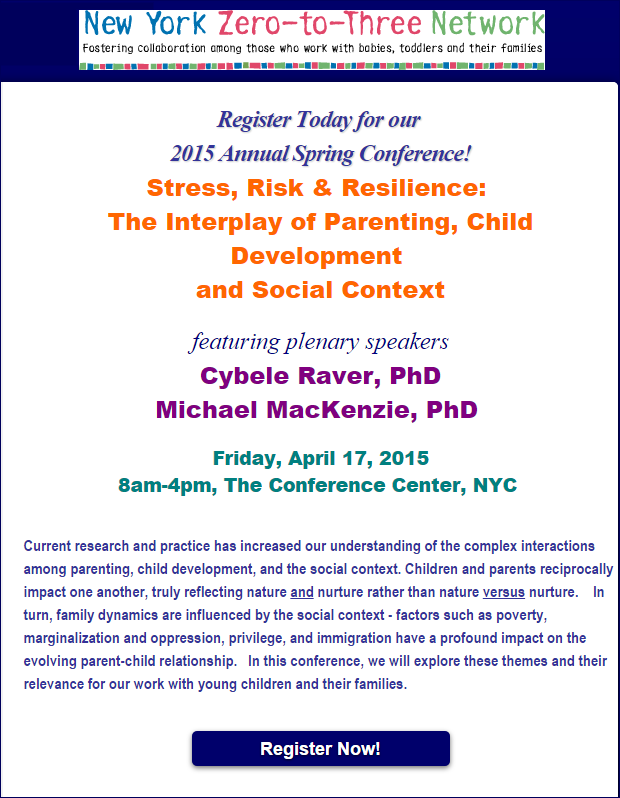 The New York Zero-to-Three Network Annual Spring Conference had a theme of Stress, Risk & Resilience: The Interplay of Parenting, Child Development and Social Context featuring plenary speakers Cybele Raver, PhD and Michael MacKenzie, PhD. It was held on Friday, April 17, 2015 at The Conference Center in New York City. In addition to the noted speakers, there were seven breakout sessions featuring speakers who are experts in their field - including the Postpartum Resource Center of New York's Sonia Murdock, who made a presentation on Maternal Depression: Building a Safety Net for Children and Families. Please click here to reach the event page (you will be leaving the Postpartum Resource Center of New York's website). 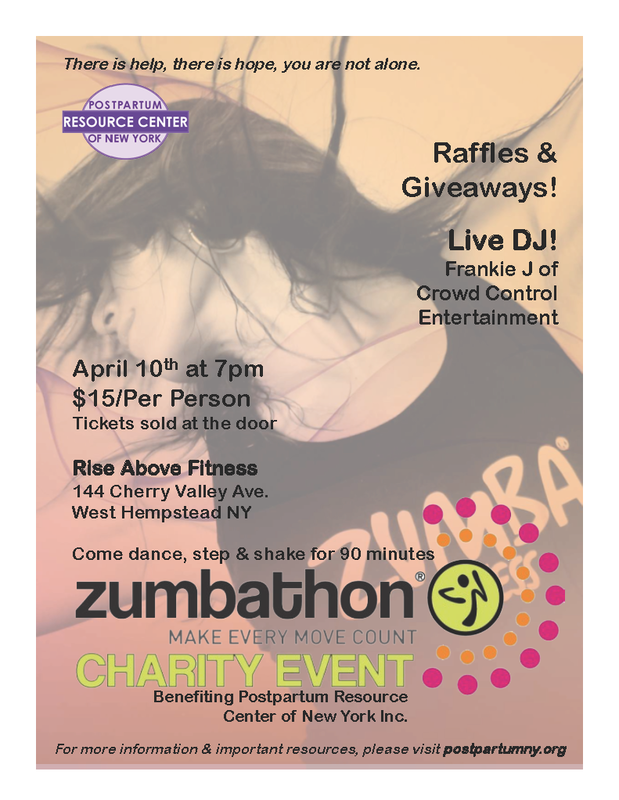 Zumbathon Charity Event was held on Friday, April 10, 2015 at Rise Above Fitness in West Hempstead benefiting the Postpartum Resource Center of New York. Click here to reach the event page and see photographs of the event itself.